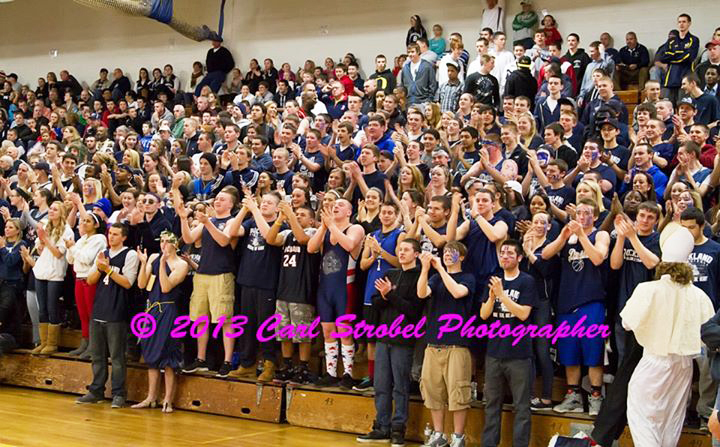 The past few years, win or lose, there has been one constant at Rockland High, student support. No matter the outcome, the members of the set known as “Bulldog Nation” would make their presence felt not only here but in gyms across the Commonwealth. The past two basketball seasons have seen minimal loss of talent and games, but monumental loss of a home court advantage, one that used to be among the best in the South Shore. Student apathy is an epidemic that is occurring at high schools and colleges around the country. As Rocklandians we are built to be different, but unfortunately this is a trend we have not withstood. In many a game this season the student section has been somewhat filled, but no noise accompanies the attendance. Students are engulfed in the likes of social media and games on their phone rather than enjoying quality basketball and appreciating the tradition that goes with it. It has not been just the basketball crowds that have suffered, however. The football and hockey teams experience the same problem. In the past two years, the football team has changed the culture at RHS going from a 3-8 team to one that has made the playoffs back-to-back years. This past October, the Bulldogs hosted a playoff game in front of an all but empty student section behind the end zone. Many students were indulging in Halloween festivities instead of watching history as the first ever playoff game was played at Rockland Veterans Memorial Stadium. At the Rockland Ice Rink, the hockey team finds themselves in the same situation. Before their run to sectional finals in 2012, hockey was a lost cause at RHS. But since 2011, they have finished as a top three team in the league and have won at least one postseason game in two of those three seasons. Last year when the Bulldogs returned to the Gallo Ice Arena in Bourne for the second round of the tournament, the seats were filled but did not nearly produce the kind of energy the fans brought in 2012 at that same arena. To use the excuse “well, they’ll probably lose” is not a viable one for not getting a little rowdy. The addition of a hostile environment can completely change the complexion of a game. A big crowd in a small gym like ours can rattle opponents and could probably cost them a couple baskets. If it makes an eight or ten point difference then are they really losing all that much now? Instead of changing the outlook of a game, students want to change their status and put their own memories on a screen instead of in their minds. No, they’d rather sit on those rock hard bleachers for a couple hours and watch as they are outdone by a smaller crowd from another town. Gone are the days of the 2013 basketball team, yes, but are the days of Bulldog Nation really gone too?